Hi hi hellooo, my name is Kim, remember me friends? I should have mentioned this about a month ago, but my Houston restaurant posts have slowed down a bit, and here's why: I was recently promoted at the nonprofit I work for, which has been very exciting!! HOWEVER, I'm way busier now, which means a) I'm going out a little less for my sanity; and b) I'm blogging a little less for my sanity. When I get home from work now, I'm more inclined to chill out (with wine, let's be real) than crank out three restaurant posts in a week, you feel me? BUT I'M NOT GOING ANYWHERE!! Because, duh, I love food too much. So. 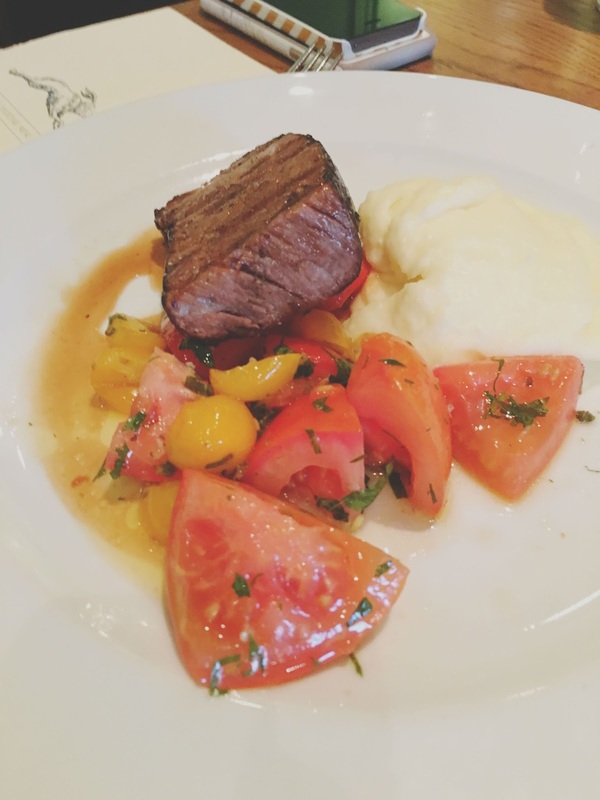 This month is exciting because not only are the Olympic sporting games happening, but the Olympic Houston food games (aka Houston Restaurant Weeks) are also happening! 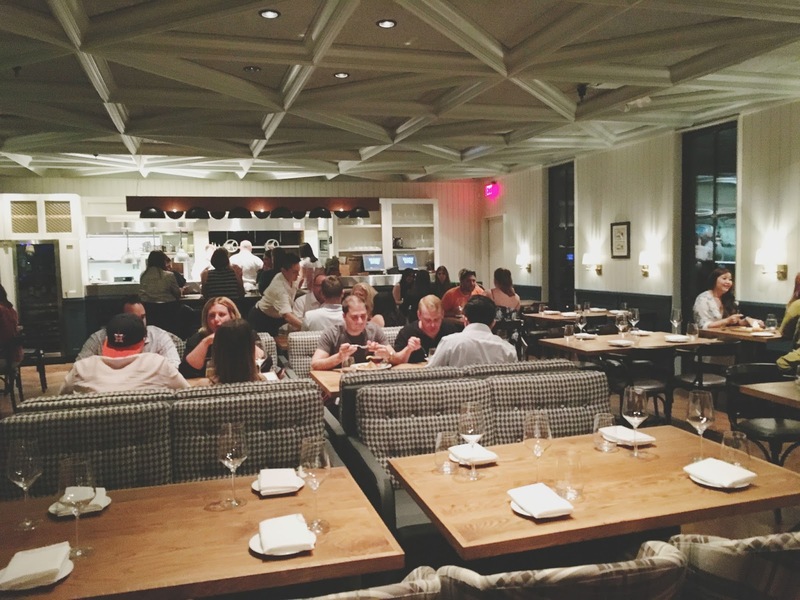 I don't know about you all, but I like to take advantage of Houston Restaurant Weeks at spots that might be a little on the pricier side that I wouldn't necessarily frequent on the reg (because my bank account says so). I met up with three of my girlfriends (Kate, Mary, and Laurel) from the Houston Livestock Show and Rodeo Wine Garden Committee for dinner there the other night. I've actually looked into dining at the restaurant before, but they never seemed to have much in the way of veg food options that really excited me. But I was pleasantly surprised to learn they had vegetarian options for all three courses on the Houston Restaurant Weeks menu, and they all looked very appealing! 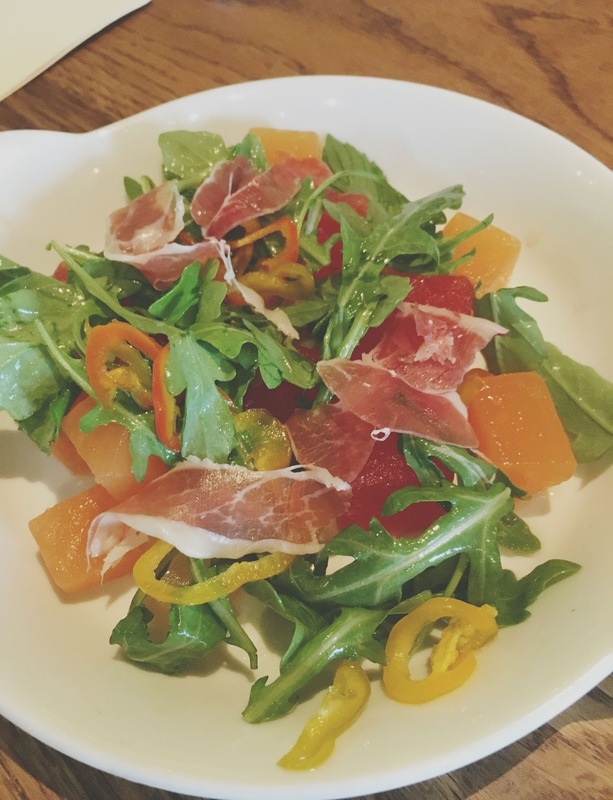 For the first round of food, Laurel and I ordered the salad, while Mary and Kate ordered the Iberico ham and summer melons. 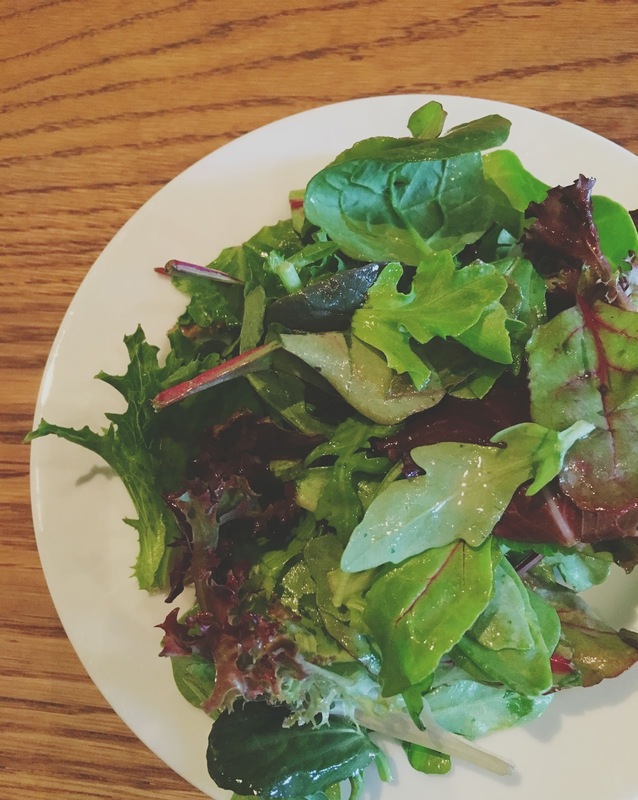 My salad was comprised of mixed greens, marinated cucumber and avocado, and a creamy avocado dressing. All in all, it was a pretty average salad. The cucumber, avocado, and dressing were placed below the greens, and everything but the dressing seemed to get lost in the mix. The dressing itself was creamy, zippy, and lovely. I just wish there had been more of the other non-leafy ingredients, or maybe even the addition of citrus and/or nuts of some sort. It was fine, but it didn't blow me away, and Laurel felt the same. Kate and Mary, however, seemed to really enjoy their first course! For the main course of food everyone but me ordered the restaurant's braised and grilled short rib. 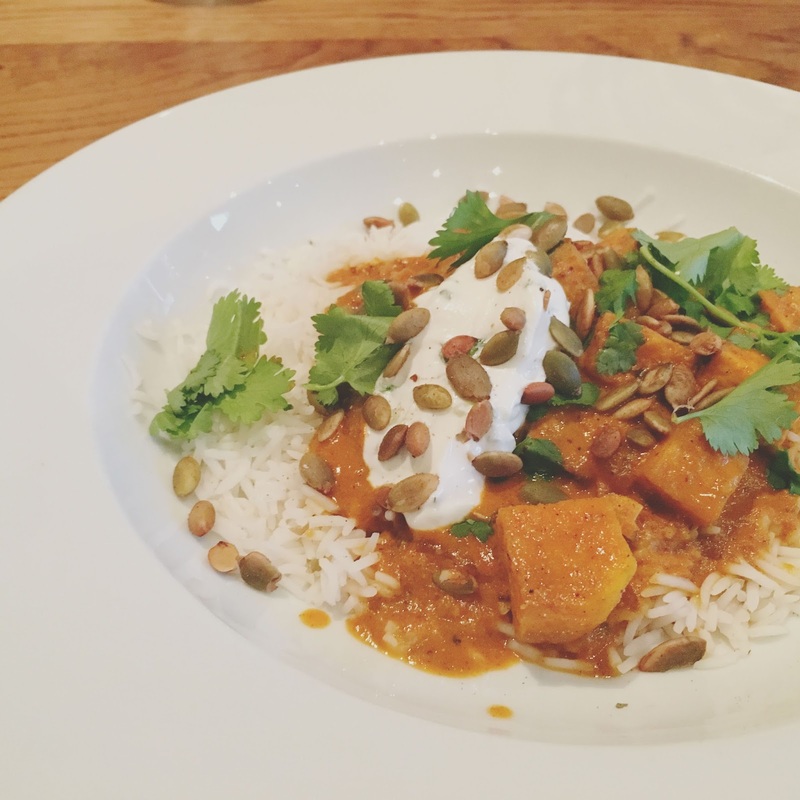 I went with the chicken tikka masala, made vegetarian. There wasn't a clean plate at the end of this round, y'all! My friends all enjoyed their shortrib, and I was a huge fan of my food. Root vegetables, and possibly some fruits (? ), swirled together in a thick curried tomato yogurt sauce atop a bed of steamed basmati rice. The sauce was earthy, warming, and comforting (you forget that it's 100 degrees outside, promise), and the rice was firm and cooked al dente, which made it stand up against the sauce. The textures (pumpkin seeds were in there I believe?) were fun and varied, and the flavors were wonderful. I was definitely pleased! For the final round we made sure to order at least one of each of the restaurant's desserts to split: the sticky toffy pudding, eccles cake with cheddar, and dark & stormy. 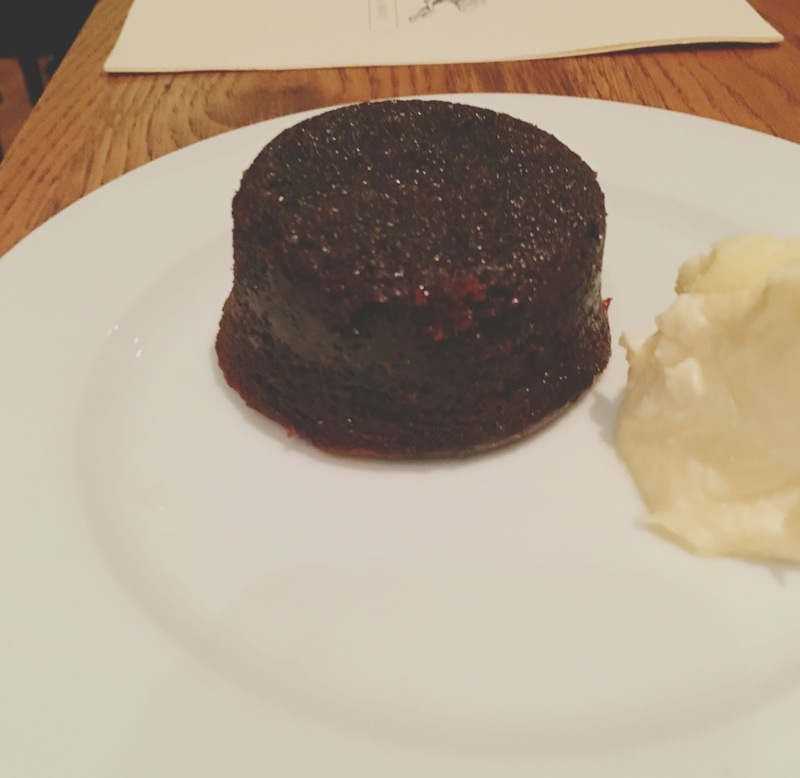 The sticky toffee pudding was not actually pudding as you might suspect (British people are such tricksters)- It was in fact a sponge date cake, soaked in caramel sauce, served with clotted cream. It was nicely spiced, sponge-y, and quite tasty on it's own, under the decadent caramel. The clotted cream added a nice softness to it though, and brought it all together. This was my second favorite of the three! 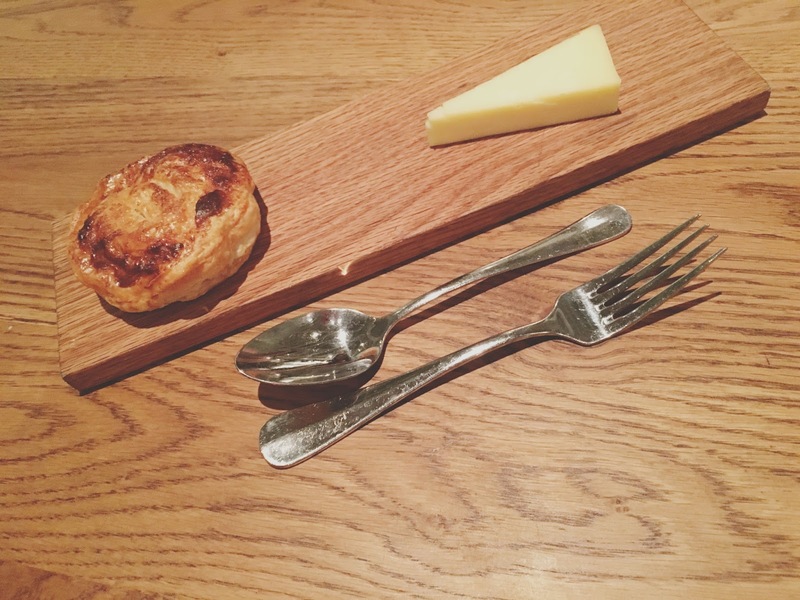 Because I don't have a huge sweet tooth, I anticipated the eccles cake with cheddar would be my favorite. While it didn't win that title, it was still very enjoyable. A flaky warm puff pastry stuffed with dried fruit, candied peel, and spices was served alongside a hunk of sharp mouthy cheddar. Cheese and bread, what's not to love? But my favorite of the three was the dark & stormy, and no not because it had alcohol in it thank you very much (okay maybe a little bit because of that). 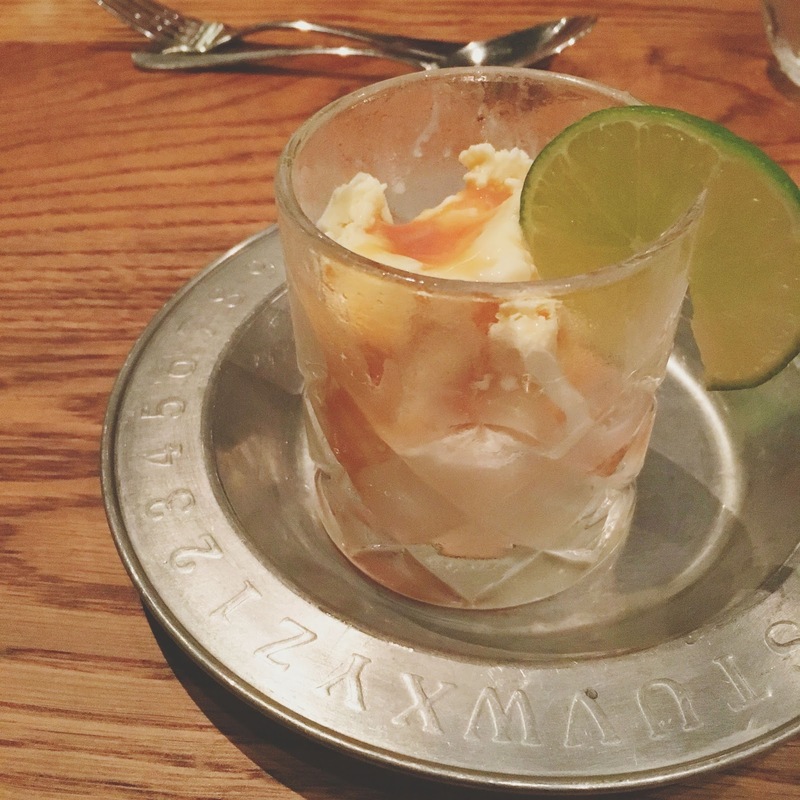 Rum ice cream was topped with rum caramel (sensing a pattern? ), lime, and ginger beer. So basically, what we were presented with was a spiked root (well ginger) beer float, and it was FABULOUS! The swirl of velvety caramel with the smooth ice cream in the fizzy ginger beer was playful, sinful, and outrageous. A squirt of lime added a nice punch as well, and I thought this was my favorite food item of the evening! 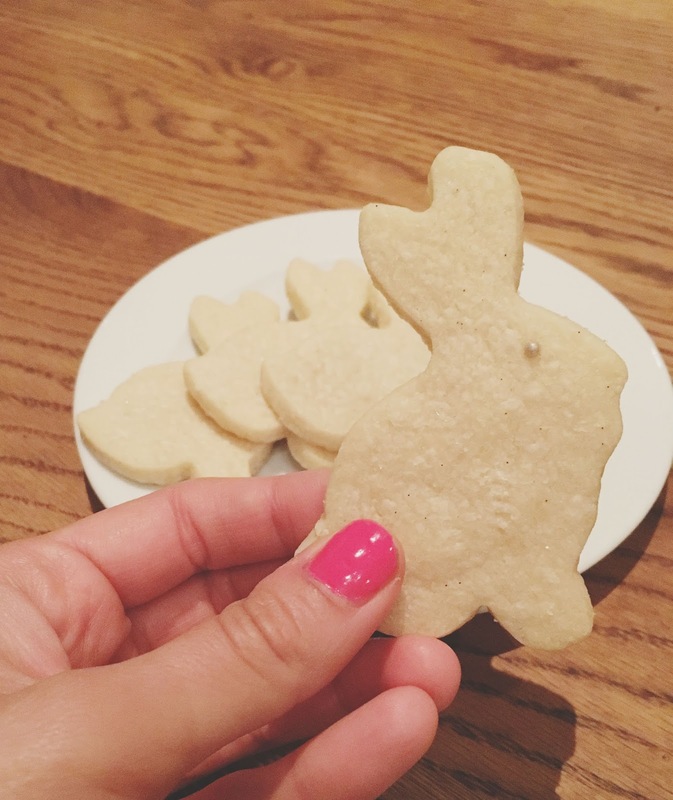 So, funny story- Hunky Dory finished up our meal with some complimentary bunny-shaped shortbread cookies. When our server brought them out, Laurel exclaimed, "WHALES!" (turn your head sideways, and I promise you'll see it). But these were SO GOOD. Like, S O . G O O D . The cookies were insanely buttery, crumbly, and melt-in-your-mouth delicious. I'd go back just for these! 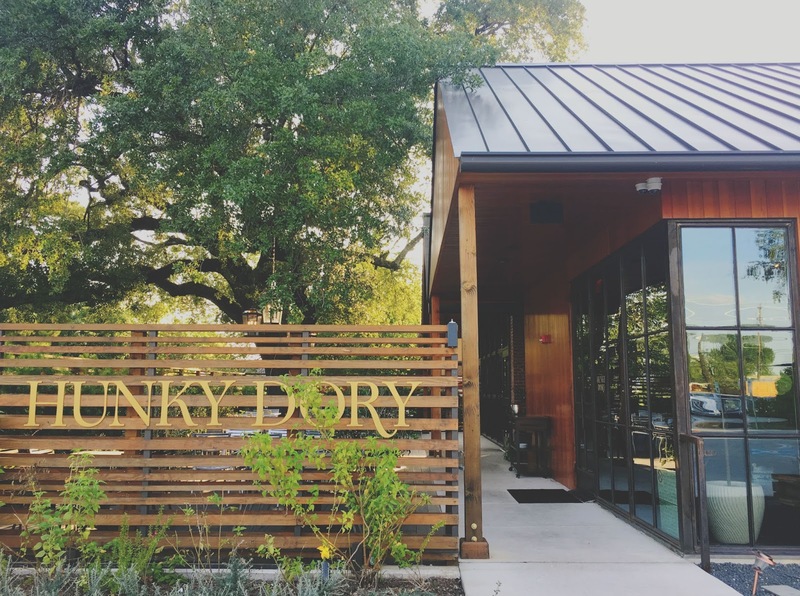 Hunky Dory is a fantastic restaurant choice for Houston Restaurant Weeks. The cozy interior is decorated beautifully, the service is great (although at times a *tad* over-attentive, but I'll take that over inattentive any day), and the food is really really good. I definitely want to go back to this great Houston Heights spot! For the whales, you know?